Learn more on the band's Soundcloud page. This review first appeared in the April 2013 issue of San Diego Troubadour. At least since Jeannie Cheatham arrived in town in the mid-1970s with her late husband, Jimmy, San Diego County has been home to some stellar female soul-jazz-blues singers. Ella Ruth Piggee, Candye Kane, Steph Johnson and Missy Anderson have spoiled local fans through the decades. Might be time to add Jaleh Mohseni to that roster. The debut from Soul Malady shows Mohseni to be a powerhouse vocalist, in a vein (and on a par) with N'dea Davenport’s recordings with the Brand New Heavies. 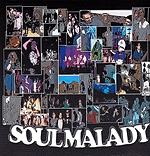 The overall vibe on Soul Malady’s five-track EP is of the Heavies’ R&B-drenched late-’90s acid jazz crossed with vintage ’70s soul-jazz: kind of Us3 meets Tower of Power. Not that Mohseni is the whole show: The band is a soul-funk-jazz thoroughbred, with a rock-solid groove behind everything, instrumentalists who can solo or join the groove. And from the photos on their Facebook page, it’s not at all clear that Mohseni even performs at every show. But on the EP, she’s front and center on every track, and her featured performances are a large part of what makes this band sizzle. Mohseni has a huge range, and can ride up above the rest of the band  but she also can inject as much grit as lungpower, and has a growl to rival Jeannie Cheatham’s. Still, for any soul-funk-jazz-dance combo, the beat is king  and the rhythm section of drummer Richie Ramirez, bassist Richard Galiguis and Patrick Logan on percussion creates an irresistible Latin-funk vibe that’s equal parts Ohio Players and Machito. And trumpeter and band leader Felix Sierra provides another bridge to jazz with his Miles-flavored solos and fills, along with the solid arrangements. Most importantly, in the sultry, laid-back “Walk on By” and the uptempo dance number “Search Party,” the band has two songs as good as anything on the radio  in a world where deejays still picked the playlists, either song could easily be a legitimate hit.